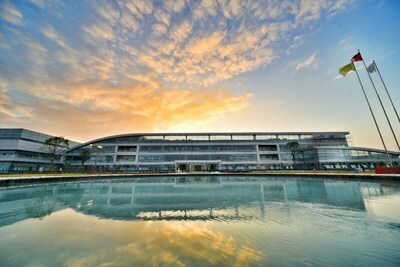 GUANGZHOU, China, Dec. 27, 2018 /PRNewswire/ — Chinese famous automaker GAC Group, the parent company of GAC Motor, has completed the construction of a new energy intelligent and ecological factory for (“the Factory”) for its first-phase project of achieving production capacity of 200,000 electric vehicles per year in the industrial park for electric and smart vehicle development (“the Industrial Park”) on Dec 23. 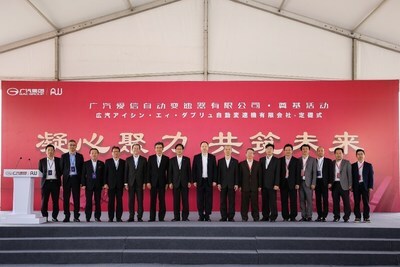 GAC Motor and Aisin AW CO., LTD (“Aisin AW”), a subsidiary of Aisin Seiki, have also hosted a foundation stone laying ceremony in the Industrial Park for their joint venture project of manufacturing automatic transmission on the same day. Provincial and municipal government officials, Zeng Qinghong, Chairman of GAC Group, Feng Xingya, General Manager of GAC Group, representatives of staff, investment companies, partners and media representatives have attended the event. Representing a RMB 4.7 billion (US$ 680 million), the Factory is the first project of the Industrial Park and has started construction since September 2017. The Factory will start production in May 2019, aiming to achieve annual production capacity of 400,000 vehicles. The GAC New Energy will release at least 2 electric vehicle models per year after that to enrich its product line and provide consumers with multiple options. The future of vehicles is electric, global, online and sharing, which highlights the importance of automated driving technology. GAC Group has started its own R&D of self-driving technology since 2011. The Aion S, featured Level 2 partial automation driving system, will be released in 2019, and will also be the first mass-produced new energy vehicle model used for developing Level 4 high automation driving system. A new vehicle model developed by GAC Group and featured with Level 3 conditional automation driving system will be put into production in the near future. On the same day, GAC Motor and Aisin AW have also hosted a foundation stone laying ceremony in the Industrial Park for their joint venture project of manufacturing automatic transmission. In April, GAC Motor and Aisin AW signed the in-depth cooperation agreement to open the new joint venture. An investment of RMB 2.13 billion (US$ 310 million) will pour into the project and its first product will go into production by the end of 2020, aiming to achieve annual production capacity of 400,000 AT units. 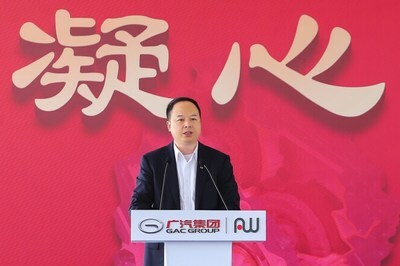 Mr. Yu Jun, the President of GAC Motor said, “After construction completed, the joint venture project will bring remarkable economic and social benefits. Its estimated annual value of production will be over RMB 3.5 billion (US$500 million). It will create many local jobs and cultivate more professionals in the field of automatic transmission manufacturing. Founded in 1969, the Aisin AW is the world’s No.1 manufacturer of AT and car navigation systems. The 6-Speed Automatic Transmission planned to be manufactured in the joint venture project, has been widely installed in GAC Motor’s vehicles including the GS8 and GS4. As part of its commitment to producing top-quality vehicles, GAC Motor has built strategic partnerships with 18 of the world’s top auto suppliers, including Michelin, Denso, Continental and more, covering areas such as core components and smart technologies, enabling its global supply chain to adhere to the industry highest standards. The GAC Motor and Aisin AW’s joint venture will enable GAC Motor to push forward the sustainable development of its high-performance parts and components supply and establish stronger global supply chain. Founded in 2008, Guangzhou Automobile Group Motor CO., LTD (GAC Motor) is a subsidiary of GAC Group which ranks 238th among the Fortune Global 500 companies. The company develops and manufactures premium quality vehicles, engines, components and auto accessories. GAC Motor has now ranked first among all Chinese brands for six consecutive years in J.D. Power Asia Pacific’s China Initial Quality Study SM (IQS), demonstrating the company’s quality-centric strategy from innovative research and development (R&D) and manufacturing to supply chain and sales & services.